We love the Christmas season as so many of you do. Here in Campeche, the rainy period is gone, the air is dry and nights can get down as low as 7 Centigrade – this is great snuggling, sleeping weather. During the day we get that deep, rich Maya blue sky that makes for perfect holiday pictures. We celebrate the season every year with three traditional festive dinners, on Christmas Eve (12/24), Christmas Day (12/25) and New Year’s Eve (12/31) – come join us for one or all! If you reserve to stay at the hotel on those nights, you will have to sign up for that night’s dinner – our kitchen is totally devoted to each meal’s preparation! The Christmas Eve dinner will be a set menu of a shrimp appetiser or a salad, turkey or carved ham with potatoes and vegetables and a dessert. Drinks are not included on Christmas Eve only. There will be an Open Bar! Including wine, liqueurs, beer and champagne (champagne on New Year’s Eve). If you are vegetarian, we can add something special for you with advance notice. If you are already committed to staying somewhere else, you may still join us. Just write ahead or stop in and talk to us in advance if you can. Of course you can just show up – we haven’t turned anyone away in all these years and there’s always room for another couple. The cost for the Christmas Eve dinner is 350 pesos plus tax and tip. For each of the Christmas Day and New Years Eve dinners, the cost is 1100 pesos ($65 US) per adult, 510 pesos ($30) per child (7 to 15), plus tax and tips. Our first Christmas here at Rio Bec Dreams, indeed our first Christmas together, was back in 2000. It certainly felt different to be outside in shorts decorating a chicle-zapote tree. As we had no power, only a noisy generator, we didn’t have lights. It was still a very special time. Our turkey was bought locally and we found out what those turkeys you see pecking at the side of the road taste like; the gravel they have been eating. We have bought proper turkeys ever since. As the years went on we were joined by travellers staying in the area who had seen our flags and longed for a little bit of home at the festive time. We were sharing our Christmas dinner before we even opened the first jungalow. Since that time it has become a tradition, like all good festivals and Diane has taken it to the max. Multi-course, free flowing wine, lots of candles and interaction. We have local people and travellers from other hotels coming each year as well as our own guests. Quite often we will have a group arrive in the afternoon asking if we have space to host their party as well. The record was made a few years ago for New Years Eve when a family reunion of 26 staying next door joined our existing group of 34, that was a party, dancing till 3 am. Decorations are a separate story. 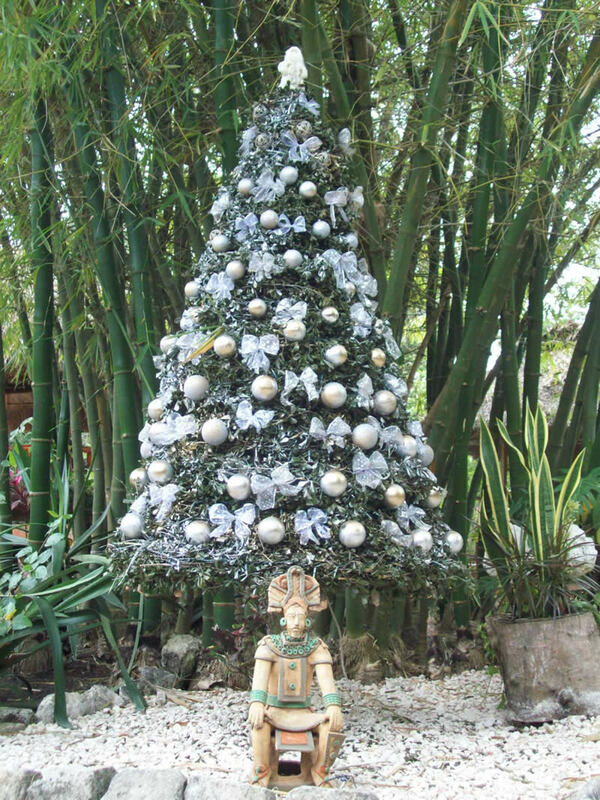 Firstly, a Christmas tree; Chetumal starting selling fir trees in 2007 but they went on sale in November. By the time Christmas came there was a hardly a needle left. We stopped that in 09 and thanks to Pati our maintenance manager, we started making our own out of local vines and ingenuity. That and the boughs and wreaths have become a tradition with us. Chetumal has outdone itself with decorations and lights and we have built up quite a cache. As we renew them, our staff get the older ones to decorate their own houses as so many people do in the towns around here. 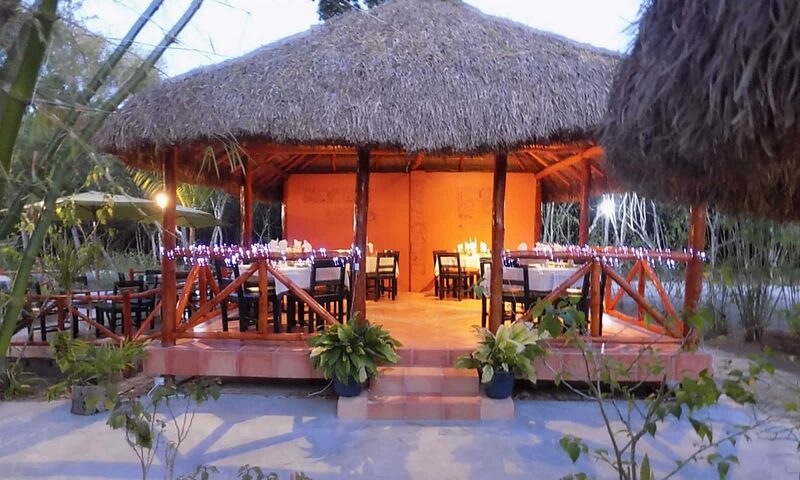 Tourism has helped the whole area prosper and we are happy to have been part of the catalyst for Calakmul. Our special dinners on Christmas Eve, Christmas Day and New Year’s Eve are always buffet. Being able to pick what you like best or try small helpings of something new is part of the tradition. Turkey and ham carved for your plate are the stars for Christmas but Cournish Hens, Duck, Salmon and whatever else shows up locally can be featured for Christmas and New Years Eve. The shrimp we can get from the Chetumal market are so tasty they take the spotlight for appetizers along with smoked salmon and trout. At least 2 salads are available. Vegetarians will be more than happy as well especially if we know in advance. Diane has some magic recipes that are tasty and healthy. Desserts are plentiful with cakes, fruit salad, pies, and homemade ice cream being just part of it. The bar opens at 5pm and we usually have some mulled wine, gluwein, brewing on the bar to make you think of skiing. Margaritas or Tequila Sunrises are usually featured but other cocktails and drinks are there too. Wine is served all night at your table and liqueurs are self-serve afterwards. Happy Holidays to all! We hope to see you all soon!